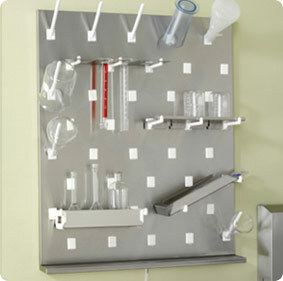 Inter Dyne Systems accessories are made of the same high quality stainless steel as our pegboards. They come with a 5 year guarantee, are autoclavable and will easily help transform your Mod-Rack™ pegboard into your own customized workstation. 4.8125" x 8.1875" x 2.5"
8.1875" x 4.8125" x 2.5 "